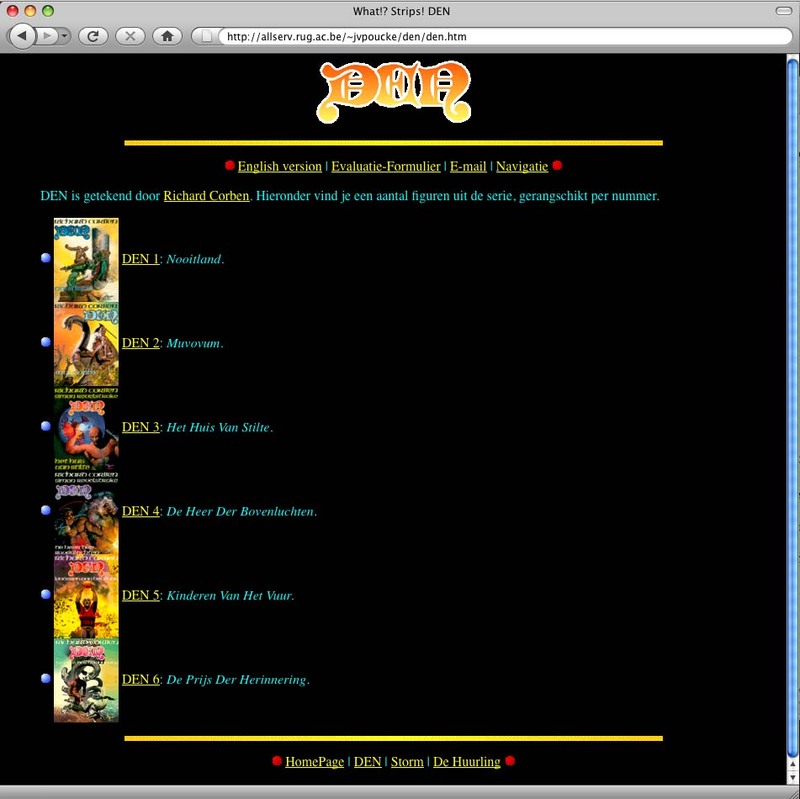 The beginning of 1996: One of the first ever made Den web site "What!? Strips! CORBEN" by Jonas and Karel Van Poucke, was made both in English (http://allserv.rug.ac.be/ ~jvpoucke/english/den/corben.htm/) and in Dutch (http://allserv.rug.ac.be/ ~jvpoucke/den/corben.htm/). (http://www.chemie.uni-hannover.de/ people/kronberg/corben/). This site is still existing in a different address. 1996–1999 (? ): French web site by Bremes (http://news.cert.fr/ francais/deri/bermes/corben/). Oct 20, 1996: French web ste BD PARADISO (http://www.bdparadisio.com/ corben.htm/). Still exising. Aug. 6, 1996: A short German page by Thomas Zimmerman (http://www.uni-passau.de/ ~zimmerth/comics/). 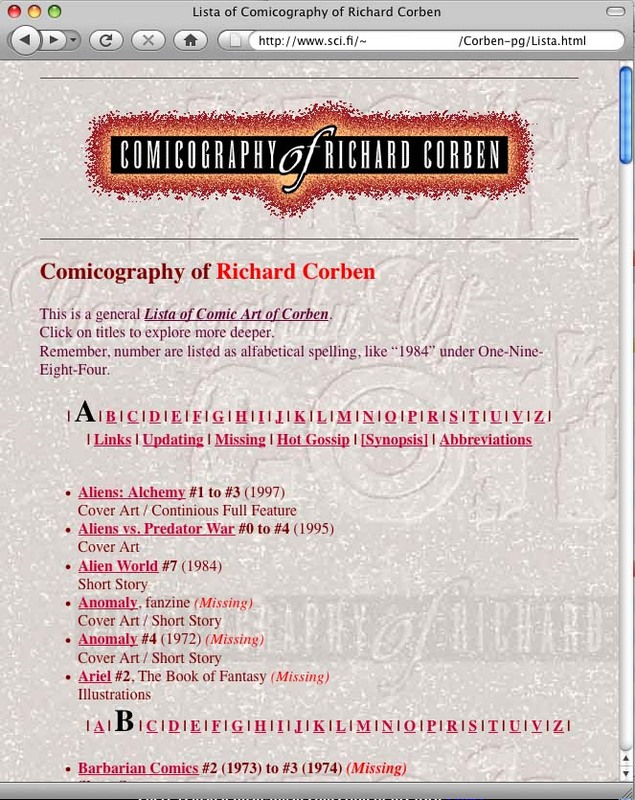 Aug. 27, 1997: I was searching something complete different from my oldie CD backups and found out that my The unofficial Richard Corben fan site (Comicography of Richard Corben) was started already in Fall 1997. That was after my visit in London, England from where I found the book The Official Underground and Newave Comix Price Guide (by Jay Kennedy, 1982). Those days I based my site entirely on the info of that book. My CD backup was made in April 7, 1998. Each page incl. full size cover art if available (see sample page). 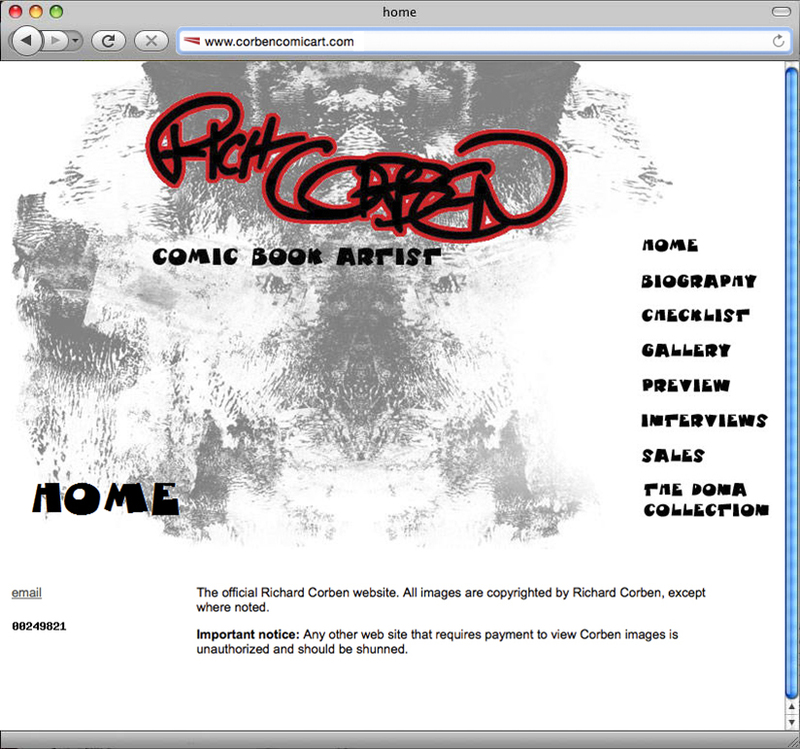 Nov. 10, 1998: The very first official Richard Corben web site (http://richardcorben.com) has been launched. The exact date is uncertain, but according the pict aside, pages were out already in 11/10/98. 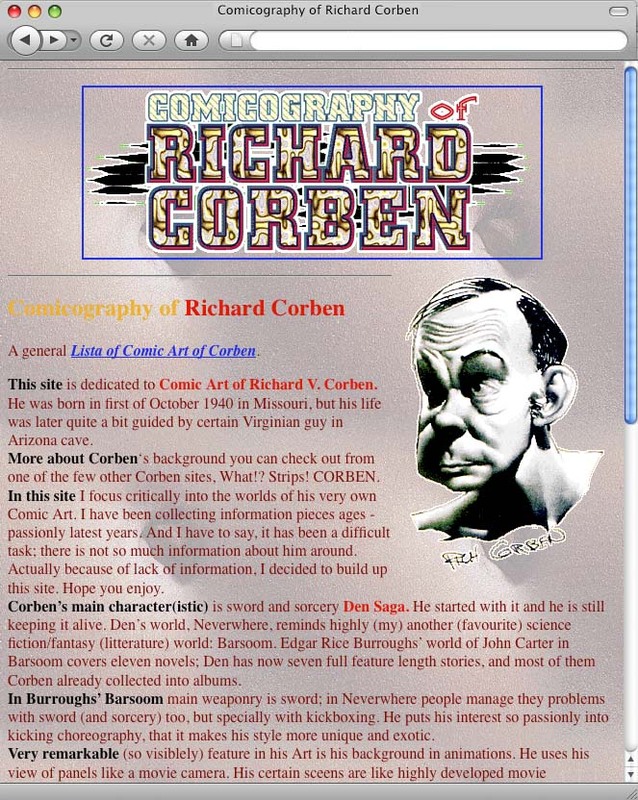 According the e-mail (dated Dec. 12, 1998) I found recently Mr. Corben stated that he put the site out in November 1998. Mine was already up in the air! 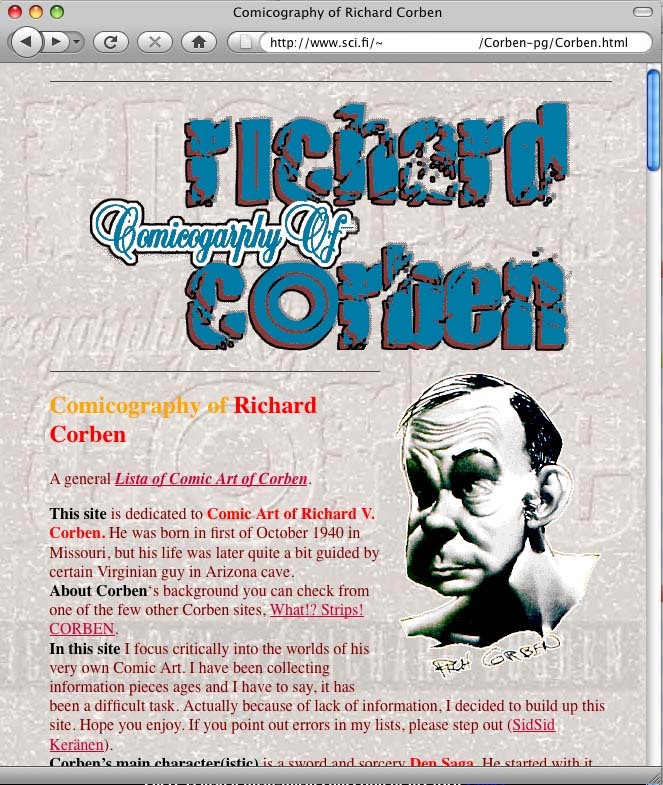 Mr. Corben's site was closed after some years and there was no official Richard Corben site for two or three years available. Visiting card, made in Summer 2002. 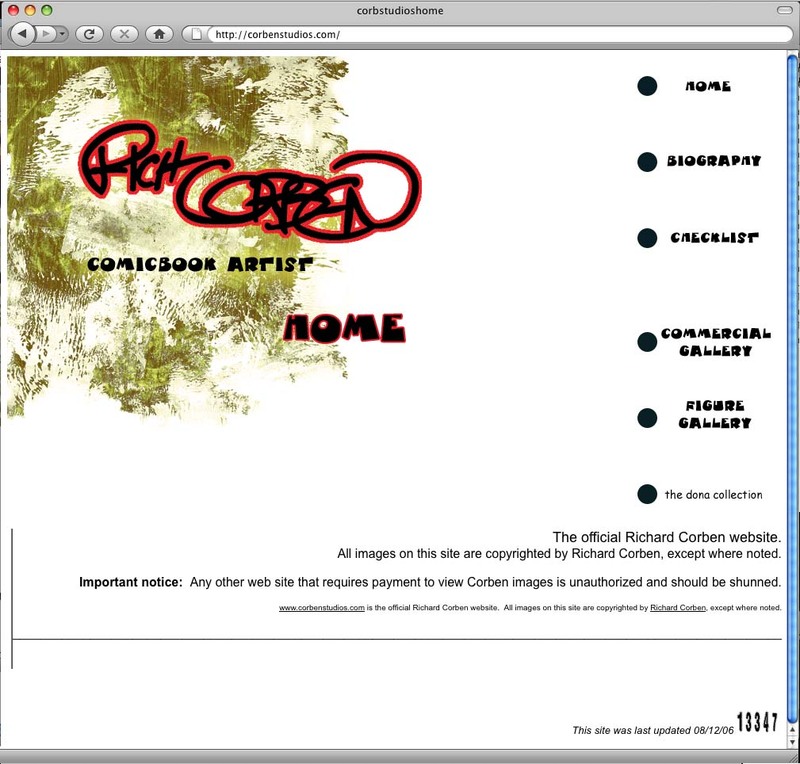 May 10, 1999: My very first unofficial Richard Corben fan site (Comicography of Richard Corben) was updated. 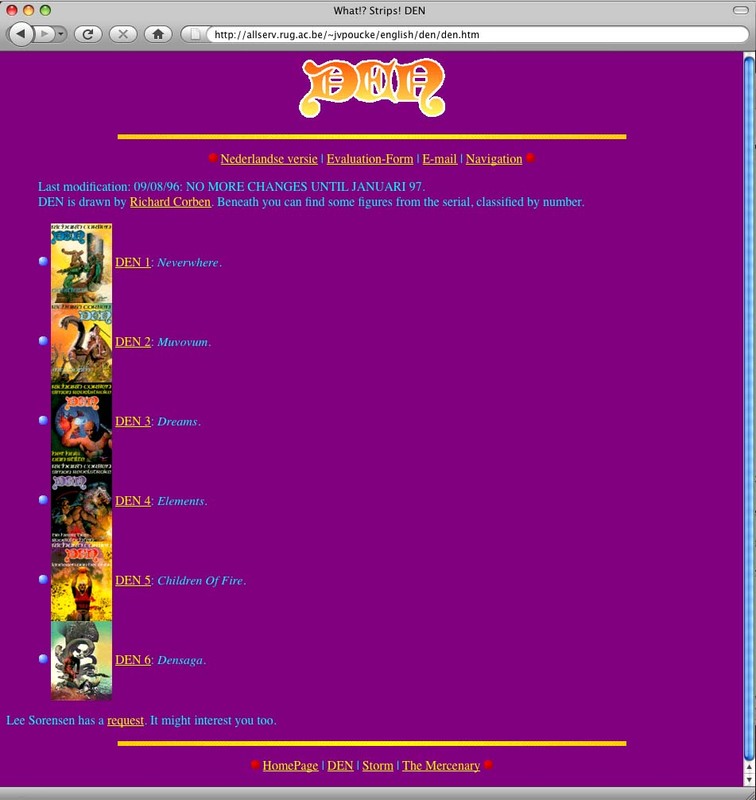 Site was started already in Aug. 27, 1997 (see above)! It was at Finnish two guy garage server firm (http://sci.fi/~sidi), which was later sold to the bigger Internet firm (http://www.saunalahti.fi/~sidi) around 2000. June 24, 2002: The Most Complete Comicography of Richard Corben found it's present address (http://muuta.net). There was mention here earlier that the starting date was May 31, 2005 but that is incorrect since I was talking about change of site with Diana Johnson in an Interview in April 3, 2002. See also full Muuta page. 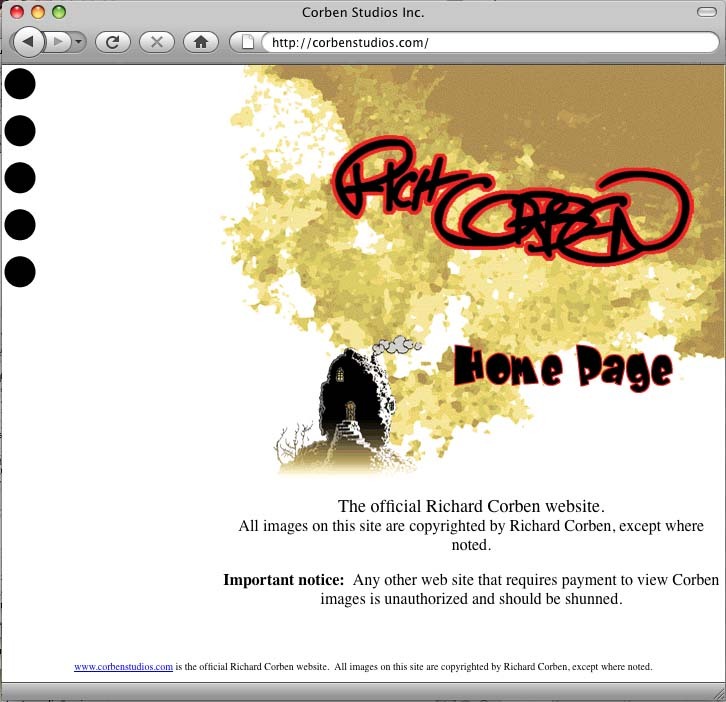 April 03, 2004: The second official Richard Corben web site (http://corbenstudios.com) was registered. 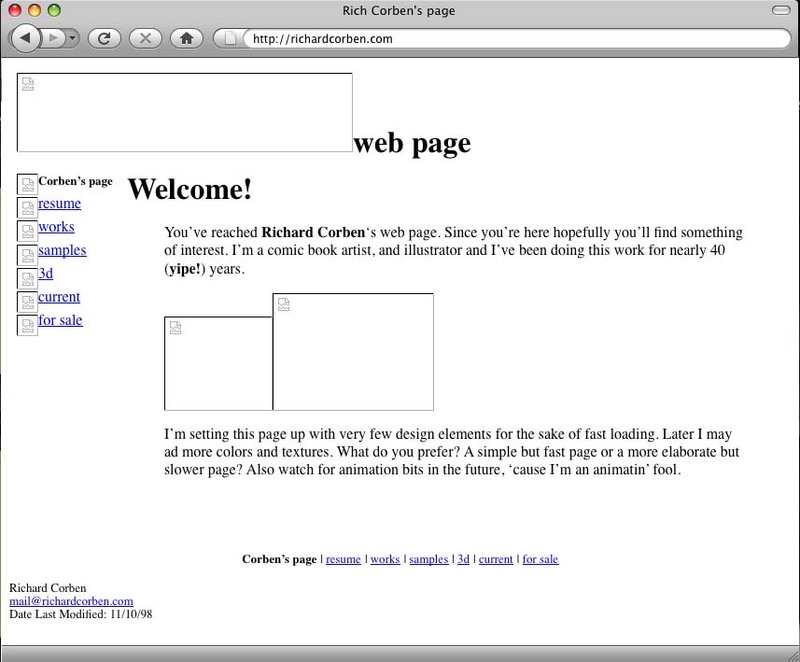 Nov. 27, 2004: The web site (http://corbenstudios.com) has got it's frist content to the pages. 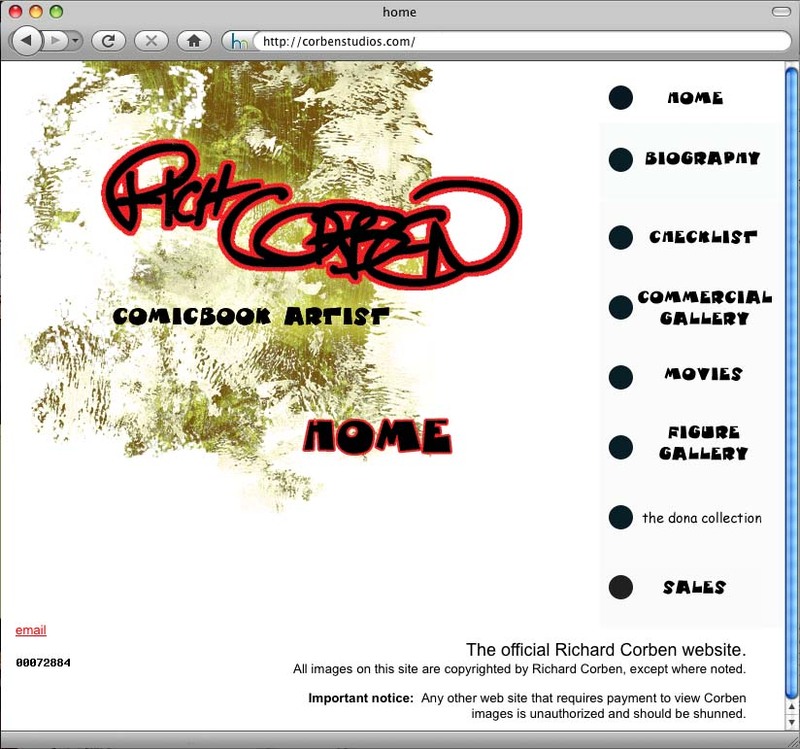 Sep. 02, 2006: The web site (http://corbenstudios.com) has got the first facelift. April 27, 2007: The web site (http://corbenstudios.com) has got the second facelift. 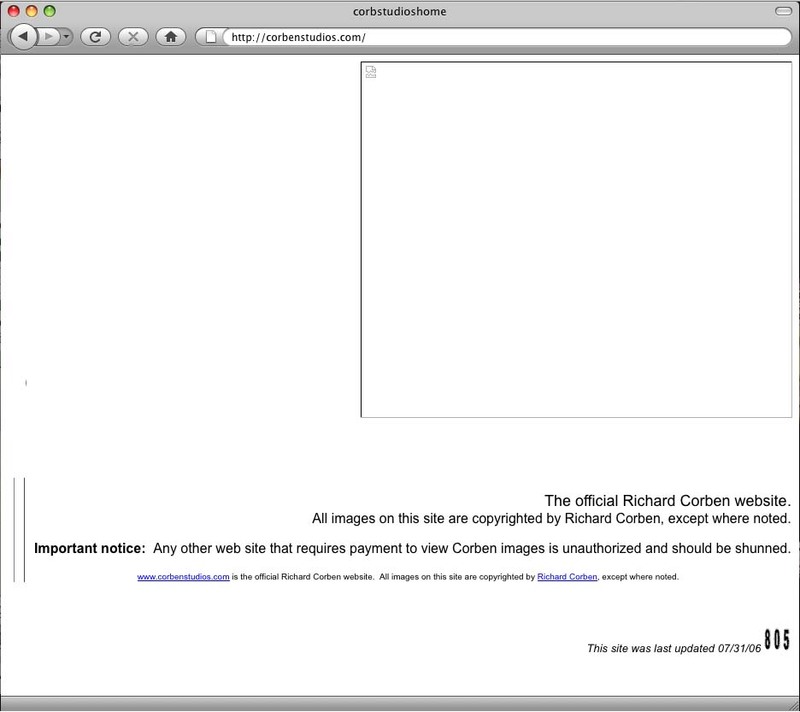 May (beginning), 2007: The web site (http://corbenstudios.com) has got the Sales section. Dec. 30, 2008: The first Flash video has been added just before new year. There was not yet a Movie section on web site. Movie was added to the Commercial section. Dec. 31, 2008: The web site (http://corbenstudios.com) has got the Movies section. 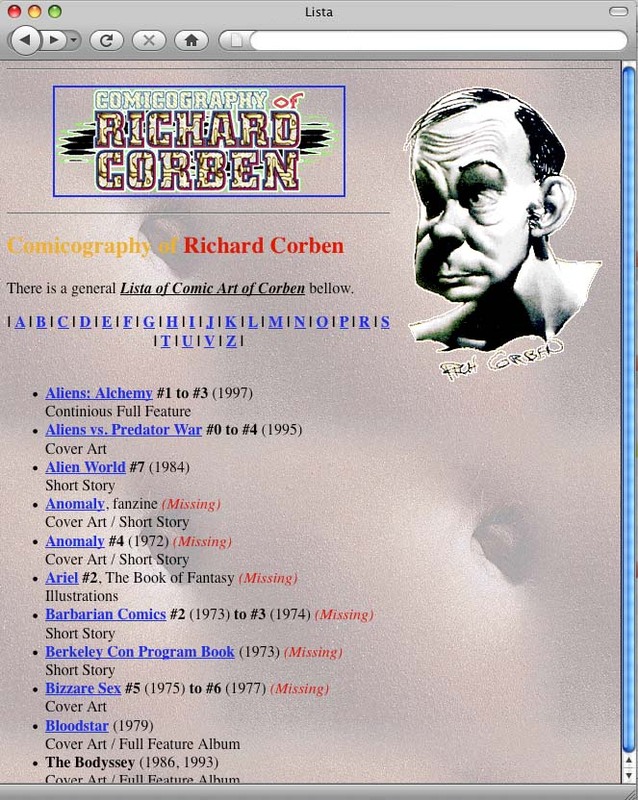 Dec. 3, 2014: The third official Richard Corben web site (http://corbencomicart.com) was launched. The output was pretty same as the latest Second Official Richard Corben web site. Created: May 22, 2009. Modified: January 5, 2019.